Emily is the oldest of her younger sister as well as three step siblings. She also has two cats, named Sunny and Zeppelin, whom she loves to take care of. During her free time, Emily loves to volunteer, dance, and play volleyball. Community service is also a huge part of Emily's life. She loves to give back to her community by helping out at her middle school's carnival. Recently, Emily began her 11th season of dance and is training in a variety of styles, ranging from ballet to jazz. She is a member of the CYM Senior League volleyball team for St. John the Beloved, her old grade school. She has an extensive interest in math and non-fiction reading and writing. In the future she hopes to soar into the field of aeronautical engineering. Her dream would be to attend the Air Force Academy. 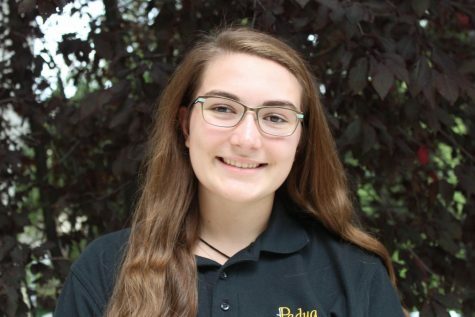 To fuel her interest of writing, she is excited to be a part of the Multimedia Journalism class and looks forward to expressing her creativity.